Rays has been involved in the world's highest-level motor races, such as the F1 and GT1 World Championships, as well as in all categories of car racing that transcend the competitive level. Not limiting its operations to Japan alone, Rays has recently taken part in car races in the United States and Europe, as well. Remaining at the forefront of development through car racing is indispensable for Rays, as more than anything else, it provides them with an opportunity to compete in earnest. Because all of the participants in a motor race are doing their utmost to win, it's simply impossible to trick the spectators, and Rays believes that putting its reputation on the line in a competition where only the real deal will prevail enables it to enhance the performance of its road wheels. Rays has won championships in various categories of car racing, but victory is not the only reason why we take part in car racing. The most important thing is to prove the efficacy of our wheels through such victories, while at the same time gaining the experience and know-how that can only be acquired by participating in car races, which are won by one tenth of a second. At wheel development sites nowadays, the boundary between computer-based tests and field tests is almost non-existent, with the former delivering almost identical results to the latter. This is why empirical data is the key to successful development. Computer-generated figures are useful only if data built up from experience is available. They are nothing more than results derived through the filter of a computer. However, if constantly updated data is used, wheels considered to have already reached their limit can be made even lighter and stronger. 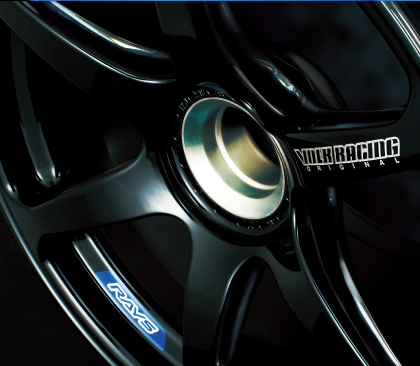 Rays doesn't just apply such know-how to the manufacturing of its sport wheels?we apply it to all its wheels. The know-how required to make wheels lighter and stronger can also be leveraged in the manufacture of forged wheels and cast sport wheels, both of which are celebrated for their high performance, as well as the dress-up wheels that decorate sedan and minivan bodies. To that end, Rays has stuck resolutely to in-house development and production and, most importantly, production in Japan. All of this is exemplified by Rays' slogan: "The concept is racing."